In 1947, Forrest Bess, who is the subject a show at the Menil that runs through August 18, moved to Chinquapin, a tiny unincorporated settlement at the end of a dirt road on the northeast side of East Matagorda Bay. ( I reviewed that show here.) Michael Ennis wrote, "In 1947 Bess left San Antonio and went to live with his parents at their bait camp at Chinquapin." After a while, Bess built his own place: "Back at Chinquapin Bess found himself again under the hypnotic, almost mystical influence of the Gulf. 'The peninsula is a lonely, desolate place,' he wrote, 'yet it has a ghostly feeling about it—spooky—unreal—but there is something about it that attracts me to it—even though I am afraid of it.' He was now determined to stay. He built a shack on a concrete slab using the hull of a tugboat and copper sheets from the bottom of an old ferry, and he added a slanted concrete 'prow' to his little home that would, he hoped, withstand the battering of hurricanes. He continued to fish for a living and to record and paint his visions." ("His Name Was Forrest Bess," Michael Ennis, Texas Monthly, June 1982) After Hurricane Carla hit in 1962, only the slab and the concrete prow of his shack remained. Bess rebuilt. It wasn't a hurricane that made him move away from Chinquapin; it was the sun. After having surgery on his nose for skin cancer in 1966, Bess moved to his mother's house in Bay City. What Ennis doesn't say is whether Bess lived on an island or on the mainland. Robert Gober describes his home as being "on a tiny spit of a treeless island" ("The Man That Got Away," Robert Gober, published in Forrest Bess: Seeing Things Invisible , 2013). Houston Chronicle columnist Sigman Byrd visited Bess at his shack, so his testimony should be authoritative--unfortunately, it is extremely ambiguous. He wrote, "After supper at Forrest Bess' house at the mouth of Chinquapin Bayou (surely the loneliest spot in Texas), we all went into the shipshape studio to drink tequila and coffe and look at our host's pictures." ("Trawling in the Collective Subconscious at Chinquapin," Sigman Byrd, The Houston Chronicle, March 11, 1956) So was the bait camp on an island or not? Either way, the place is remote. Chinquapin lays on East Matagorda Bay between (but not particularly close to) Matagorda and Sargent, two barely-there communities. The nearest town of any size is Bay City, with about 20,000 residents, 25 miles away. But why should we care where Bess lived? He was an important artist, and I like knowing about the lives of Texas artists. That's probably reason enough. But I think there is more to it. This place was obviously important to who Bess was and how he made his art. A frustrated sexuality played into his esoteric theories, which informed his paintings. Bess was homosexual, but had no outlet for it in Bay City, where he was afraid to reveal himself. While he was in the army, he received a savage beating when he divulged his homosexuality. While he was able to meet other gay men in Houston and San Antonio, he complained that they found him too masculine. After his retreat to Chinquapin, he may have experienced no sexual relationships, much less romantic love. (No wonder he was such an avid letter-writer--his correspondents, who included Meyer Schapiro and Carl Jung, were some of his closest acquaintances.) Loneliness shines out in his work. While it seems obvious that these factors contributed to his art, I think the place he made the work is also important. He started seeing the visions that fueled his most important work after he moved out to Chinquapin. Would he have seen the same things, done the same work, if he had been living in Houston or New York City? I guess it's possible, but it seems to me that the extremity of his life on this desolate shore must have had some effect on his art. Jesus and the stylites also went to bleak remote locations to facilitate their visions, after all. I drove out to Chinquapin in June to see what I could see. Chinquapin Rd. is a 10-mile dirt road off of FM 521. It takes you through miles and miles of corn fields and past the Big Boggy National Wildlife Refuge. My iPhone, chirping at me to turn right or left on this dirt road, seemed to be leading me to the end of the Earth. But finally I reached East Matagorda Bay. There are a number of houses at the end of Chinquapin Rd., apparently all built after Carla which, by all accounts, scraped this area clean. The houses are all on a winding creek called Chinquapin Bayou which runs down to the by from Lake Austin, just to the north. The whole area is surrounded by water--lakes, creeks, the bay, marshes--and very little of it rises more than a couple of feet above the water. People in these parts are fishermen and shrimpers. My first trip out there was inconclusive. If Forrest Bess lived on the mainland, he didn't leave any obvious trace (not that I was expecting to find anything visible after 49 years). And if he lived on an island, as Gober writes, I couldn't access them without crossing the Intracoastal Waterway. I didn't have a boat and wasn't quite confident about my swimming ability. So I looked around a bit, took a few photos, and left. The remains of a concrete slab on the mainland--could it be Bess' cabin's foundation? Eric suggested that he might be able to wrangle a boat and got my contact information. I marked it down as merely a conversation over beers at a party--I didn't really expect anything to happen. I put it out of my mind and moved on to other projects. Then in late June, I got an email from him. The expedition was on. He had a friend from the National Oceanic and Atmospheric Agency who needed to take a trip out to Matagorda to look at a couple of potential habitat restoration projects. We set a date and I shared what maps I could find. Assuming Bess lived on an island that was near the terminus of the Chinquapin Rd., I figured there were only four islands it could be. As it turned out, Eric's friend from NOAA, Kristopher Benson, was interested in checking out Bird Island, which is a protected wildlife habitat. Kris is a marine habitat resource specialist at the Galveston NOAA National Marine Fisheries Service Laboratory located in the old Fort Crocket Buildings. His proposal was for us to accompany him as he went to West Matagorda Bay to look at an oyster reef, then over to East Matagorda Bay to see Bird Island. My work schedule is such that every other Friday, I have a day off. So on July 19, I drove down to Galveston early in the morning, meeting Eric at GAR at 7:30 am. We drove together over to NOAA and met up with Kris. We had a comfy government Suburban and a flat-bottom aluminum boat in a trailer behind us. The boat reminded me of the boats I used to work on when I worked doing shallow water seismic exploration for Western Geophysical back in the 80s in Nigeria and Brazil. It was designed to go very fast (it had a large outboard motor) and to be able to operate in very shallow water. The tradeoff is comfort, but that's OK--it was a work boat, not a pleasure boat. I thought it was strange that Eric happened to know a NOAA scientist. I chalked it up to the fact that Galveston is a small town, but the reason was actually more direct. Kris is married to the director of Artist Boat, a art/education/environmental non-profit in Galveston. Artist Boat has lots of projects that combine art and the environment, including a purchase of some of the last undeveloped land on the west end of Galveston for the purpose of keeping it wild. Kris had firsthand experience mixing art with the environment, so our little expedition was right up his alley. We headed off first to Palacios, a small pretty town on West Matagorda Bay. Palacios has a sizable population of Vietnamese immigrants and their descendents. We drove past a Vietnamese neighborhood that could be a suburban subdivision in Houston--brick homes, cul de sacs--except for the shrimp nets drying in the back yard. The other weird thing about Palacios is how people pronounce it--the Spanish origin has been totally forgotten. Folks say "puh-LA-shush". We entered the bay from the public boat launch. It was still early, and there wasn't a breeze. The water was smooth and occasionally glassy. The sky blended with the water at the horizon, leaving us in an indistinct space of blue. Matagorda Bay was like a giant naturally formed James Turrell. The bay was filled with jellyfish--thousands of them. We elected not to do any swimming. Kris opened the throttle and headed out to a spot that seemed like literally the middle of nowhere. The bay is large and even at full throttle it took a while to get to our destination. We had maps and a GPS device and were using them to try to find a particular oyster reef known as Half Moon Reef. Kris later wrote me with a description of the project: "The currently funded phases of the project will restore approximately 40 acres of oyster reef through the placement of substrate material to restore the 3-dimensional structure of the reef and the hard substrate needed for recruitment and settlement of oyster larvae (spat). My purpose in visiting was to get a sense of the on-the-ground conditions at the project sites, as they are in an area of the coast that I'm only rarely able to get out in the field to see. We are also working with The Nature Conservancy on oyster restoration projects in other areas, so comparing these sites with those areas is helpful in understanding how our projects function." NOAA is one of the many federal and state agencies cooperating on the Half Moon Reef project. Except for the shrimpers, we were mostly alone out there. It was an astonishingly isolated place, even though we knew Palacios was nearby. Finding the reef was not easy. The map and the GPS device didn't seem to exactly match up. Nonetheless, Kris took samples of the salinity (high due to the drought) and dragged the anchor to look at the contents of sea bed. When we headed back, the motor started conking out. It seemed that it wasn't drawing fuel. We switched out fuel lines and messed around with it, but we couldn't get it to work quite right. We limped slowly back to the landing at Palacios. I was worried that this was the end of our expedition, but Kris was still eager to see Bird Island. So we loaded up the boat, stopped for some bahn mi sandwiches, and pressed on, driving over to the Chinquapin Road and thence to East Matagorda Bay. I assume that population of 30 refers to full-time residents.There were more than thirty houses there, and they looked like weekend retreats for serious fishermen. Some were quite nice (but far short of the palatial beach houses on Galveston's West End), but most tended towards the ramshackle end of the spectrum. Sometimes they looked as if they had been built one piece at a time, perhaps over several years. I like the one above because it is a classic dogtrot style house. But it worries me, too--a stiff breeze and some heavy rain will flood it. I don't know how these houses compare to what was here in Forrest Bess' day. But let's just say that the powers that be have never bothered to pave the Chinquapin Road. The community is extremely remote and the dwellings pretty modest. The Chinquapin Road ends at the Intracoastal Waterway. 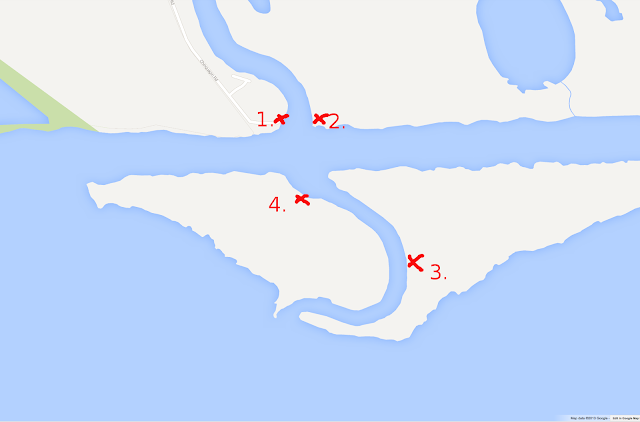 Islands 1, 2, 3 and 4 are on the other side of this dredged-up channel. But we had to launch our vessel from a private boat launch further up Chinquapin Bayou, which meanders very lazily to the bay. (This is no Houston-style channelized bayou.) I was worried that we'd stall out again and be stranded. Eric stayed on shore just in case we needed to call for help. It took many tries to get the motor to start, which didn't boost my confidence. But Kris seemed unconcerned. We headed out very slow on the bayou. It was very shallow and he didn't want to risk stranding us by going too fast and hitting a sandbar. Once we crossed the Intracoastal Waterway, we passed through the narrow channel (really a continuation of the bayou) between islands 2 and 3. Before the Waterway was dug, these islands had been part of the mainland. But because of this narrow channel, they are now desolate uninhabited places. But was that always the case? It was on island 3 where we saw this little fella. We couldn't tell if it was a starving coyote or a fox or a stray dog, and we wondered how it managed to survive on this treeless desert island. Were there mice to hunt? The islands were devoid of human habitation of any sort. The only sign that people had been on the islands were from the raised areas (where dredged mud had been deposited in decades past), detritus that had washed ashore, and the occasional duck blind. There was no obvious ruin of Bess's shack, which we didn't expect to see anyway. Just scrub grass and shrubs, some birds, and our fox friend, who we saw more than once as we rode around the islands. After cruising past all three islands on the Intracoastal Waterway side, we went out bay side to check out the other side of each island. Kris decided to land on island 3 (he offered to go ashore on each of the islands, but I didn't see much point--they were all the same). Except where the islands had been built up with dredged material, the land and water blended seamlessly. The boat went through this area of grass in about six inches of water before reaching dry land. These islands were fairly long but very narrow. As I stood on the south side of the island, I could see a tugboat on the north side in the Intracoastal Waterway. There was constant barge traffic here. Bess started to have visions of symbols when he lived here. The visions are the source of the symbols we see in his paintings. These islands are so small and isolated, and may have been even more isolated in the 1950s. It doesn't seem all that strange that someone living here would start to see things. Particularly someone blessed (or cursed, as it may have been in Bess' case) with imagination. 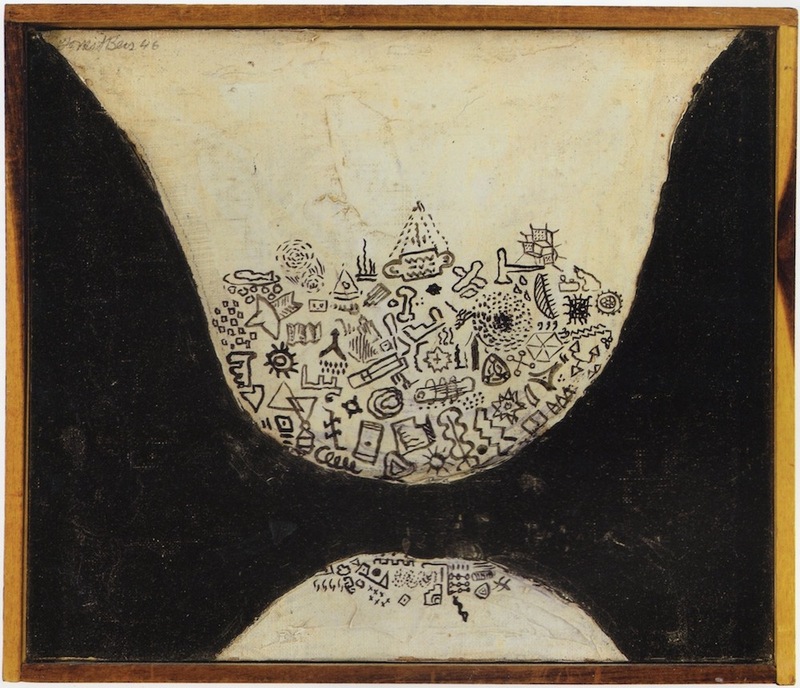 Forrest Bess, untitled (The Crowded Mind/The Void), 1947, oil on canvas, 10" x 11 3/4"
Bird Island was one of the reasons we were there. It is a protected bird habitat, and this tiny spit of land is covered with birds of all different species nesting. It's far enough from shore that predators like the fox can't get to it. Kris wrote me that "the Bird Island site in East Matagorda Bay (also called Dressing Point), and the adjacent Half Moon Shoal area, are areas where a project concept has been proposed by multiple state and federal agencies. NOAA did not originate the project concept and does not yet have an official position with regard to the concept. In general, the proposed project would prevent erosion of the island and stabilize the shoal, and possibly expand the size of the island." So while NOAA was not officially involved with any proposed Bird Island project, Kris was interested in checking it out. And you can see why. Birds already use every square inch of the island for their nests. I was astonished to see so many different kinds of birds, from roseate spoonbills to cormorants to brown pelicans and more, nesting side by side. I was torn by a desire to get closer and a responsibility not to disturb the nesting grounds. Even if we never saw the exact spot where Bess's cabin was, it was worth the trip to see Bird Island. It was a breathtaking sight. I only wish I had brought a telephoto lens. We made our way back to the landing, where Eric was patiently waiting for us (hoping we hadn't managed to stall and strand ourselves). Tired and a little bit sunburned, we loaded the boat onto the trailer and headed back to Galveston. As we drove back, Kris told me that NOAA might be able to help me find the exact location of Bess's cabin. 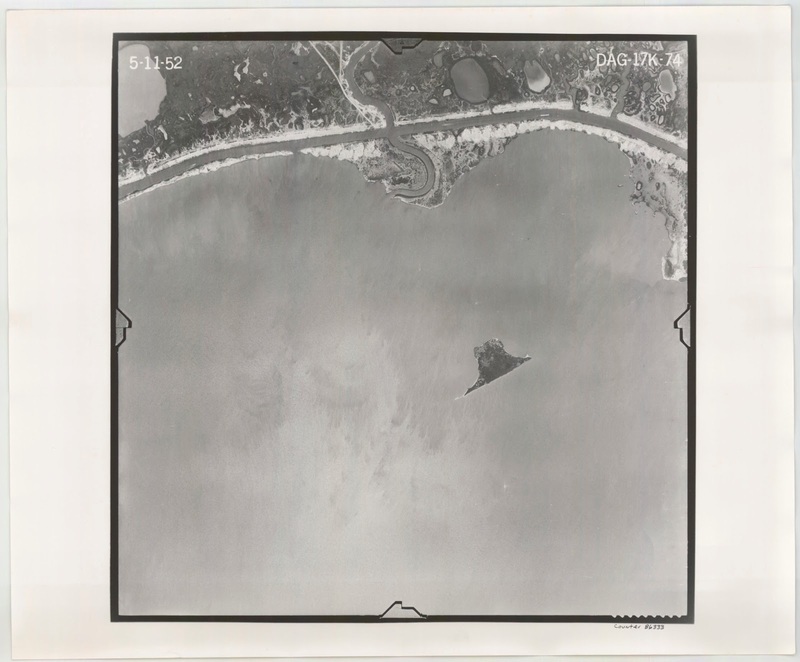 It turns out that people have been taking aerial photos of the coastal areas of Texas since the 1940s. He uses them in his work to determine how habitats have changed over time. This is an aerial photo from 1952 of the northeast part of East Matagorda Bay. You can see Bird Island in the center and the Intracoastal Waterway running as a stripe across the top third. Chiquapin Bayou and the three islands are easily visible, but island 3 is connected to a larger island. Between 1952 and now, there has been visible erosion of the islands. 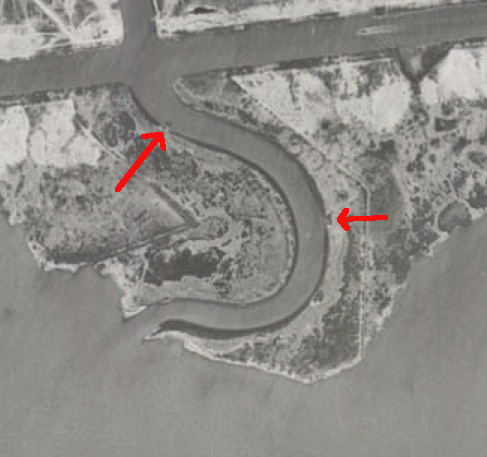 Here we can see what appear to be two structures, one on island 2 and one on island 3. (Island 1 and 2 were apparently a single island back then.) Could one of them be Forrest Bess's shack? And the other his parents' bait camp? It's possible I suppose. Then again, I could have it completely wrong and they could have been on the mainland. What would I do if I found the location of Bess's cabin? I'd like to go back and put a plaque in the ground there. And wouldn't it make sense to petition the state government to name that island after Forrest Bess. Here is one of Texas's greatest artists, and as far as I can tell he had nothing named after him. "Forrest Bess Island" would be a nice start. But most of all, I'd like to maybe cmap out on the spot--just pitch a tent, close my eyes and see what visions come. Shortly after I wrote the article above, I saw painter Richard Stout at the Menil bookstore, and mentioned my search and the difficulty of finding Bess’ camp. Stout instantly said it was on an island. 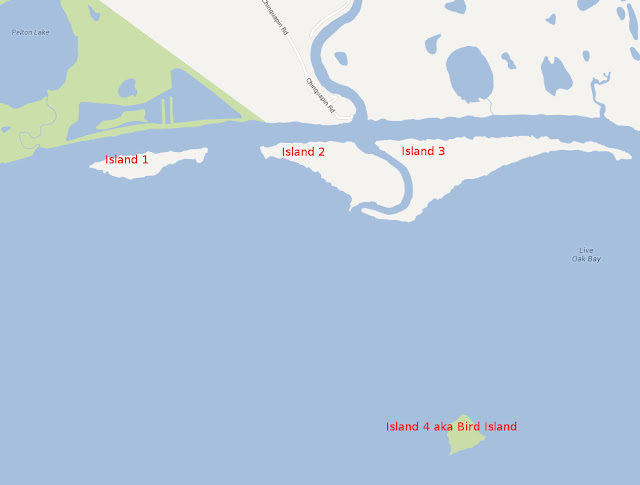 I asked him which one–pointing out that two islands at the mouth of Chinquapin Bayou are separated by the bayou itself. He thought for a second and said, I think the east island, which was the island we saw the fox on, aka Island 3. I walked into the store, and bought a copy of Forrest Bess: Key to the Riddle, a new book version of Chuck Smith’s 1997 documentary film. It’s more about Bess the man than his art and reproduces a number of letters and photos, including photos of Bess’ shack! The book definitely states that the bait camp is on the island, on the bayou side. Fishermen coming from the mainland would go through the bayou channel, pull up to the little dock Bess built, and yell out for him to bring out some bait shrimp. So the mystery was getting close to being solved. Or was it? After the original version of this article was published, I started hearing from people who had ambiguous evidence and contrary eyewitness testimony. First, I received a scan of a letter from Forrest Bess that featured a hand-drawn map. It seemed to confirm that the shack was on island 2. But then Bob Bess, Forrest Bess's nephew, wrote a letter to Glasstire indicating the camp was on the mainland! I sent him an email with the following image attached. I asked him which, if any, of these four locations was the location of the camp. He confirmed that it was #2--on the mainland, on the west bank of Chinquapin Bayou. "If you have seen The Key to the Riddle DVD, I am the young boy with Forrest (probably about 1952). That was obviously filmed at the camp." Despite the repeated references to an island in various texts, Forrest Bess's home was on the mainland. This fits with what Sigman Byrd wrote in 1956--he wrote about having to be ferried back to his car. Chinquapin Road is on the east side of the bayou. And it even matches Forrest Bess's hand-drawn map, which didn't indicate north. The reason I thought it indicated a camp on an island was because I was looking at it upside down. Thank you for the great adventure. POLL: Where Do You Houston Artists Live? Salon des Refusés- Fun-Fair-Positive Arts?